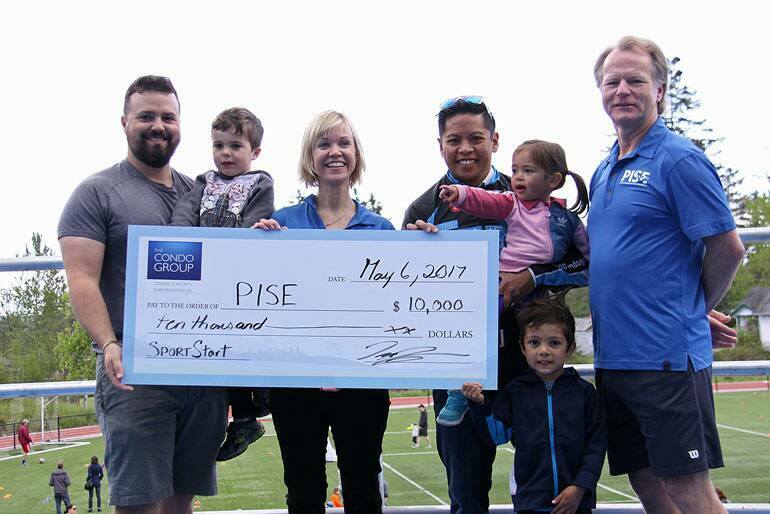 In honour of The Condo Group’s 10th anniversary, we are pleased to announce that we have partnered with the Pacific Institute of Sport Excellence (PISE) to sponsor their SportsStart Grant. On Saturday, May 6, Tony and Chris were on-hand at PISE’s Family Sport and Recreation Festival and presented The Condo Group’s $10,000 contribution to Robert Bettlauer, CEO of PISE, and Stacey Lund, Business Development of PISE. We take great pride in our community, and we wanted to give back to the various groups that helped shape our team members. Sports is an important facet to each of us here, especially Tony’s, and it was important that we find an organization to help support in our community. PISE works with elite athletes and the local community, using with state of the art technology and trainers, in partnership with Camosun College. The organization believes in creating a “healthy, active community” and is passionate that physical activity improves people’s overall well-being. Located on the Camosun Interurban campus, this incredible facility offers a fantastic opportunity for young athletes to master their sports and for the larger community to get involved in physical fitness. As well, PISE works within the local community to provide fun, active summer camps, offering the opportunity to kids who may not otherwise afford it. Our grant will help with these efforts, ultimately seeing about 40 kids get a chance to enjoy some summer days involved with a variety of sporting activities. Beyond the summer camps, PISE works hard to educate the local community on the importance of physical activity in youths. Especially in an era where we can quite easily adopt a sedentary lifestyle, we need to make sure we teach kids how to be active, and PISE does just that. Join us in saying thanks to PISE for all of the incredible work they do, and we can’t wait to continue our partnership with this fantastic organization. Did sports play a role in your life? Share your story on our Facebook page. We would love to hear it!